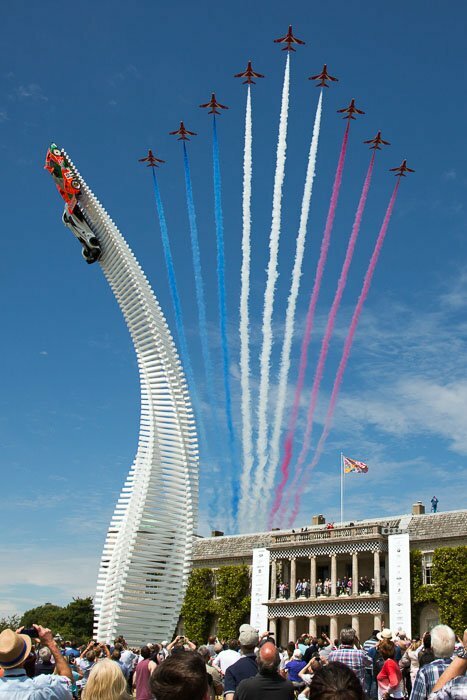 The two main flying days are both wings and wheels events and are the leaders in their class: Goodwood Revival and Goodwood Festival of Speed. Goodwood Revival, usually in September, has a focus on F1, GT and saloon cars and motor cycles dating from 1966 or before. These cars are often driven by current and past champions, reviving the days when the Goodwood was home to the primary race circuit in the UK. The air displays usually include wartime aircraft and there are around 30 pre-1966 aircraft on static display in the 'Freddie March Spirit of Aviation'. Goodwood Festival Of Speed is usually in late June or early July, typically linked to the date of the British F1 Grand Prix. It generally includes fewer but newer aircraft including modern types, again against the background of a massive range of motors and all things 'speed', including bikes. See either the Goodwood Revival or the Goodwood Festival of Speed page for more details of the specific event. The Goodwood estate comprises the historic Goodwood House and estate, with a racecourse, park, hotel with health club, and an airfield surrounded by an active motor circuit. The airfield, known during WWII as Westhampnett, was a busy satellite station to Tangmere and was the airfield from which Douglas Bader flew his last mission. The airfield is situated between the south downs and The Solent, well clear of controlled airspace, and now provides flying lessons and a base for private aircraft as well as events with a flying element.